Family camping. Two small words calculated to strike fear into even the most experienced outdoors person. Panic not, for it’s perfectly doable with the right equipment, attitude... and maybe a case of gin on standby. When it comes to the best tents for a family, the most important features are weatherproofing and spaciousness; some sort of living area for your family to relax/squabble in when the weather turns. There are other features and considerations to keep in mind, too, such as whether you want black-out 'blinds', a large communal porch area, or zippable inner rooms to give everyone some privacy. Family tents are a contentious breed, covering a range of accommodation from oversize mountain tents to sprawling fabric mansions, replete with built-in hot tubs, carports and wide-screen TVs. When scouring the best tents for a family and trying to find the one for you, the big questions to ask are: how adventurous do you plan on being, and how big is your family? The mega-sized family tents are about as portable as a circus marquee, so you’ll be restricted to staying at ‘proper’ campsites within driving range of home. In this strictly car-camping category, inflatable designs are popular, and with a car-powered compressor you’ll be pitched in minutes. However, these types of family tents tend to be costly, heavy, and run the risk of punctures. Lighter, more portable options will be more flexible in use, with some light enough for general hiking. These are inevitably smaller in scale, so that carefree holiday on Bodmin might turn into a nightmare with four of you packed into a tiny space in the lashing rain. 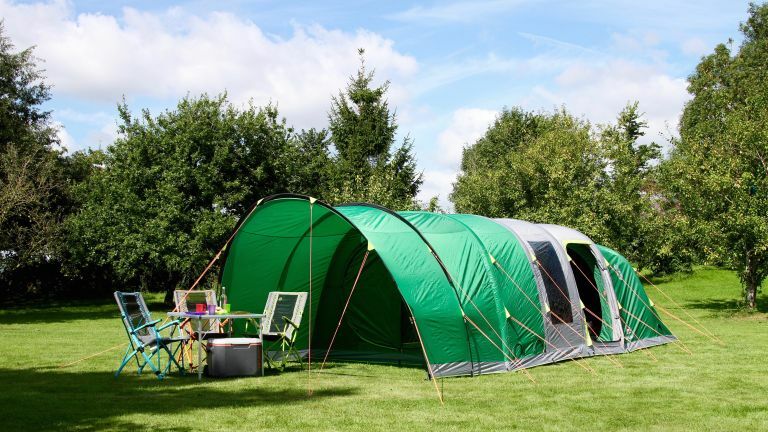 If your attitude is ‘go big or go home’, this stylish family tent will see you happily ensconced on any campsite across the land in an extensive family palace. Featuring two bedrooms and a sizeable living area, this beast sleeps five with ease, and utilises an inflatable structure (so there are no poles to break or to leave at home). There’s an undeniable romance to the tipi, and the Robens brings modern practicality to the table as well. There are downsides to having a single communal space, such as noise and small children arising before dawn, but there are upsides too—warmth being a big factor. The Robens Field Station is easy to pitch, with a single central pole and an integrated groundsheet cutting faff. A total weight of 7.7kg compared to a sleeping capacity of eight makes it pretty portable too (in theory less than 1kg per person). If height is of paramount importance in your search for the best tents for a family, you’ll be quids in here. This glamping beauty offers plenty of headroom for the lanky of frame (1.8m) , and the sub-£400 price tag puts it within reach of keen camping families. The Papa Hubba might not have the airy grace and palatal aspect of some of it’s family tent peers, but it has a surprising trick up it’s minimalist sleeve: a total weight of 2.67kg. This epicly low figure means the Papa Hubba is portable, making it an ideal choice for more rugged and remote camping trips where you have to lug a tent and equipment for miles. With a respectable three-season rating, this MSR family tent is a genuine go-anywhere double-walled space that will leave you in charge of choosing your camping destination, rather than being tied to commercial campsites. No best tents for a family round-up would be complete without at least one fiendishly priced offering from the French outdoor brand, and this is a doozy. The cheapest family tent here by a country mile, you might not get luxury but you do get a lot of tent, with two bedrooms and a decent living area in between. Sleeping four with ease, this has all the mesh fly screens, random pockets and portability (11kg) you’d expect, with none of the excess or quirkiness of more costly models. For simple, car-based family campsite action you could spend a lot more and get a lot worse. With a name straight out of Hollywood, and a structure that appears to accelerate into the future, the Coleman is all ingenuity and cutting edge tech. Gone are the days of being woken by sunlight and birdsong at 4am, as the FastPitch Air Valdes has ‘BlackOut’ bedrooms that block 99 per cent of light from the two sleeping areas. One of these can be removed (taking the six-man tent down to a four) if extra living space is needed, although a large porch already provides plenty of cover. At two metres high there’s headroom for all, and the ‘FastPitch’ inflatable air poles means it can be put up by just one person when using the included pump. The Vango is a brilliant family tent at a keen price point, sleeping four in comfort and with a good size living area to boot. You'll thank us for this when you're three days into a family camping trip and craving your own space. Although headroom is relatively low at 1.55m, that’s sufficient to sit and relax of an evening, even in the worst weather. Weighing in at a reasonable 7.9kg, Vango's entry into our best tents for a family round-up is an old-school campsite classic, and as it’s from Vango, it’ll probably last a lifetime.